How do your billing policies and procedures compare with other accountants and bookkeepers? Should you implement changes to help improve your firm’s efficiency and operations? 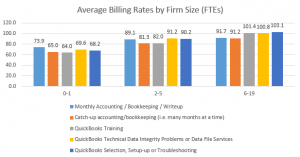 Let’s examine more results from Intuit’s Billing Rate Survey. Fixed fee and value pricing is more common for monthly accounting/bookkeeping/write-up work (57%), payroll (57%) and tax preparation (68%). For catch-up accounting/bookkeeping (i.e. many months at a time), 61% use hourly billing. However, I think fixed fee or value pricing should be used instead of hourly billing for catch-up work. When using QuickBooks Online it is easy to import bank and credit card activity (via a .qbo, .qfx, .ofx or .csv file), set up bank rules and process a year or more of transactions in a fraction of the time previously required. Check with the bank or credit card company to download transactions older than 90 days. If you can only get PDF bank statements, there are tools available to convert the PDF into a file which can be imported into QuickBooks. (Check out the QB Power Hour archives for recordings on this topic.) With this ability to get many months of transactions processed in a fraction of the time, hourly billing just doesn’t make sense (unless you want to make less money). ProAdvisors and firms with an online focus are implementing technology and automation features in their firms’ billing practices. QuickBooks Online makes it easy to automate recurring sales receipts or invoices (which can be automatically emailed too) for monthly accounting and/or payroll services. The recurring transactions in QuickBooks Online are truly automatic – there is no need to login or do anything. Then, with QuickBooks Payments, clients can pay online and it is automatically recorded in QuickBooks (along with any credit card fees associated with the payment). Or better yet, set up recurring Sales Receipts to automatically process the payment from the client’s bank or credit card (with their permission and signed authorization form). This is a great opportunity for savvy accountants to save valuable time by automating your billing and collection procedures. 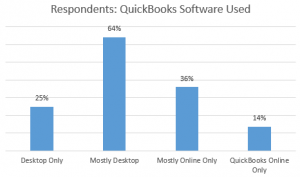 Additionally, it is interesting to note that only 51% of the QuickBooks Online only users report that their employees track their time (64% total). As more accountants implement fixed fee or value pricing, many are no longer tracking their time. With the automation and time saving features of QuickBooks Online and other technology, hourly billing often doesn’t make sense anymore. This area of the survey results revealed some startling results for me – 75% reported that they have reduced the total fee without the client asking! How often does an attorney, plumber, electrician, or any other service provider charge you less without you saying anything about it? As accounting professionals, we need to realize the value of the services we provide. While it may be ‘easy’ for us, it isn’t for our clients! You probably have years of education, training and experience which is valuable! We shouldn’t undermine our own prices! Another interesting result – 51% reported that a client has objected to the total fee. I would surmise this occurs when the accounting professionals is using hourly billing. Switching to fixed fee or value pricing should reduce client objections since they would know the total price before the work begins (or at least a price range). Plus, most of the accounting professionals (82%) subsequently reduce the fee when the client objects. Reducing fees isn’t a good practice and most of us would probably like to avoid it. We should strive to do a better job communicating with clients about the fees upfront. Using an engagement letter would help clarify the services provided and associated fee. As shown in the chart above, only 65% reported using an engagement letter with most or all of their clients. Did you identify opportunities for changes to your firm’s billing methods, policies or procedures? Have you automated your billing process yet? Now is a great time to start implementing changes to your billing. If you want to continue learning more about QuickBooks, join the ProAdvisor Program (for accountants and bookkeepers working with multiple clients – it is free for QuickBooks Online training, support and certification) and join me for QB Power Hour webinars (free). NOTE: This was originally posted on Intuit’s Firm of the Future website. 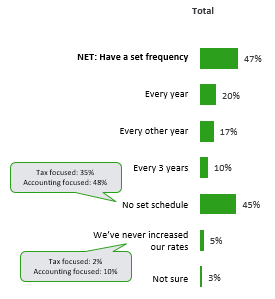 I’m thrilled to share the initial results of Intuit’s Billing Rate Survey again this year. The survey included questions about billing rates, billing practices and more. The survey respondents were a variety of accounting professionals (i.e. 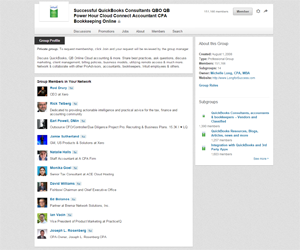 bookkeepers, accountants, tax professionals, etc.) with various levels of education, experience and expertise. Keep this in mind and use the survey results to provide some insight and information for your consideration when establishing your own billing practices and rates. Keep in mind, this article has the initial survey results. Watch for upcoming articles with more detailed breakdowns, billing practices and more. Plus, for a white paper you can download with all the results, make sure you are subscribed to this blog. As I reviewed the survey results, I noticed a few things which many accounting professionals may want to include as possible action items for themselves or their firm. 1. Increase your billing rates. Only 20% of survey respondents reported increasing their rates every year and 45% have no set schedule for increasing rates. Assuming you are working, then every year you have more experience and expertise. Plus, many of us have continuing education, obtain or renew certifications, attend webinars or conferences and more. Thus, each year we are more valuable and our rates should increase to reflect your additional experience, education and expertise. Besides, don’t you deserve an annual raise? If you increase the rates a little every year, then you avoid large increases or rates that are too low. If you haven’t increased your rates in awhile, now is the time to do it. You may lose a few price sensitive clients, but they probably are not great clients anyway and usually wind up leaving when they find someone cheaper anyway. Focus on clients who value the services you provide and are ‘A or B’ level clients. Most the responses were from ProAdvisors (82%), QuickBooks Desktop users (64%) and were solopreneurs or had 1 Full Time Equivalent person working with them (53%). Below are charts with the details on the survey respondents. 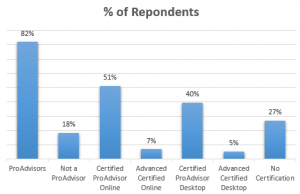 Advanced Certified ProAdvisors report the highest average rates (with one exception), then Certified ProAdvisor, ProAdvisors and finally non-ProAdvisors. This is what I would expect to see. 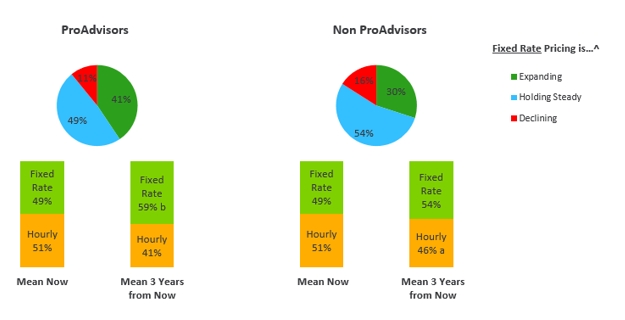 It clearly shows that members of Intuit’s ProAdvisor Program charge higher rates than non-ProAdvisors. If you are not a ProAdvisor, I would encourage you to join now! 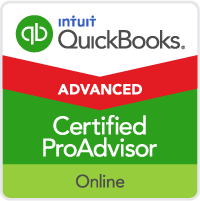 There is free membership level which provides access to QuickBooks Online software, training, certification, support and more. You can learn more and sign up here. Additionally, the survey results demonstrate one of the benefits to getting Certified and Advanced Certified – higher average billing rates. 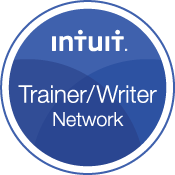 In addition to the self study training (recorded modules and supplemental PDF guides) in the ProAdvisor Portal, Intuit provides numerous free training opportunities to help ProAdvisors get certified – webinars, live in-person training events in numerous cities and virtual conferences too. Plus, most of the training includes free Continuing Professional Education (CPE) credits as well. Details on the free training for certification prep and other topics can be found here. Note — click on an image / chart to enlarge it then back to return to this article. As expected, CPAs report the highest average hourly rates (with one exception), then Certified ProAdvisors and finally Certified Bookkeepers. 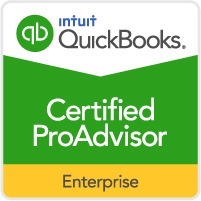 If you are a Certified Bookkeeper, I recommend you join Intuit’s ProAdvisor Program and become a Certified ProAdvisor as mentioned above. Below are the average hourly billing rates by designation and service. 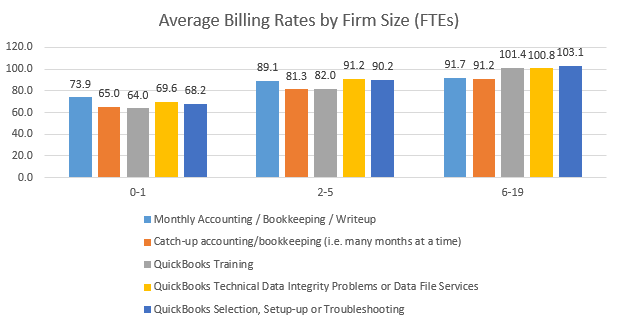 Again, the results of the average billing rates reported are as expected – the larger firms report higher average billing rates as shown in this chart. Improvements in technology and automation features in accounting software is allowing accounting professionals to streamline our workflow and operate more efficiently. Thus, many accountants and bookkeepers are switching from hourly billing to a fixed fee or value pricing method. 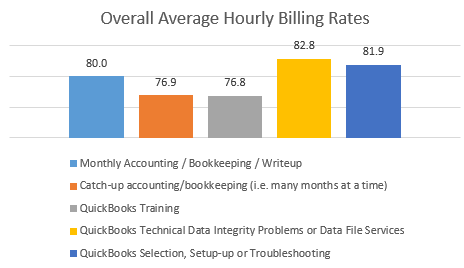 As you can see in the following charts, currently it is almost evenly split between fixed fee vs. hourly billing. However, 34% of accounting professionals expect to increase their fixed fee billing in the next 3 years and it is higher among Certified ProAdvisors. This is what I expected based on the accounting professionals I talk with across the US and in various social media forums. What are your thoughts about the initial survey results? Did anything surprise you? Did you discover you need to increase your rates? Leave your comments as a reply below. Watch for other articles with more details and discussions of the results of the average billing rate survey – including details about billing practices, discounts and more. Stay subscribed for future articles and a white paper with all the results for you to download. Here is a subsequent article with results on billing methods, procedures and write-offs. Note: This article originally appeared on Intuit’s Firm of the Future website. Last call for Boot Camp registration – discount ends Monday, July 11, 2016 at noon and course starts Tuesday, July 12, 2016. You’ve been asking for more hands-on training, and we’re delivering. The two award-winning accounting industry CPAs, Michelle Long and Sandi Smith Leyva, are teaming up again to present an advanced workshop on accounting and bookkeeping practice management. Plus, there will be plenty of time for hot seat coaching throughout the workshop. Pricing, how to get what you’re worth and how to get paid every time. You’ll get lecture, exercises, and extensive Q&A time on these essential components that will take your business to the next level. And don’t forget, everything you learn in this course can not only be applied to your business but also your clients as you take on the role of trusted advisor. The dates range from July 12, 2016 through July 28, 2016 and all webinar sessions will be recorded. Michelle’s 5P session at the Ultimate Accounting vCon was the highest rated session of the entire conference, and now you have a chance to go deep with two well-loved coaches and trainers on these five business essentials. I just wanted to let you know about a great event coming up for you on July 12-28, 2016. Another chance to work “on” your business instead of in it. Co-presented by two award-winning accounting industry CPAs, Michelle Long and Sandi Smith Leyva, this workshop series won’t be repeated and is a don’t-miss event. You’ll get lecture, exercises, and extensive Q&A time on these essential components that will take your business to the next level. Starts July 12, 2016. Early bird price through end of June or until seats fill. There are two great training opportunities to help accounting professionals grow their practice in various cities across the US this May and June. The events are Becoming a Firm of the Future and QuickBooks Online (QBO) Certification Prep (descriptions and details below). In several cities, Becoming a Firm of the Future is in the afternoon and the QBO Certification Prep is the following day. However, in some cities, only the QuickBooks Online Certification Prep is offered. Get all the details and Register now to reserve your spot — the events are FREE! What is a firm of the future and why it is important? What are the steps to become one? Learn which QuickBooks to choose and how to talk to your client(s) about moving to the cloud. Plus, how to convert to QuickBooks Online. Understand how to automate and streamline workflows for you and your clients. Learn about time-saving features in QuickBooks Online and how 3rd party apps can save you and your clients time. 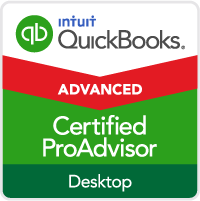 Learn about the QuickBooks ProAdvisor program (which you can join for free) and tools that help add value for your clients. Plus, the benefits of value pricing and how to start implementing it for your firm. Learn about the Find a ProAdvisor directory where small businesses look for ProAdvisors, and how to improve your profile/search ranking. Plus, we’ll discuss other social media sites (including Linkedin, Facebook, etc), who to connect with, the tools to manage social media efficiently and how to create and share content. Bonus: Earn up to 9 CPE credits. And, complete your QuickBooks Online Certification exam onsite to earn a reward! I hope you’ll register for a city near you! If you attend one of my sessions, please say Hi and introduce yourself! We will demonstrate each option and discuss the pros and cons of them. Plus, Dan Lowell, Intuit Group Manager, Global Accountant Education….. will provide an update and answer questions about the recent changes for ProAdvisors to maintain their Advanced Certification status as mentioned in this recent post. 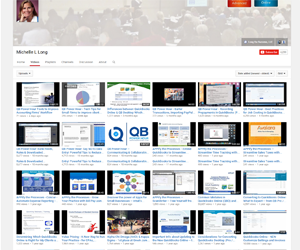 As always, you can earn up to 1 hour of FREE CPE for attending QB Power Hour live. Can’t attend live? register anyway to get the follow up email with the link to the recording. QuickBooks Online Accountant (QBOA) is designed for accountants, bookkeepers and others who work with multiple clients. It helps improve our efficiency when working with multiple clients. One of the benefits is a QuickBooks Online Plus subscription as ‘Your Books’ in QBOA. Ideally, you will use it to maintain your own firm’s books. Initially, this is a great way for you to practice and get familiar with using QuickBooks Online (QBO) using your own data. You can convert your QuickBooks desktop file into Your Books quickly. Then, set up your bank feeds and start working with it for more experience. If you want to, you could continue using your desktop file (running them in parallel) while you are playing around and getting more experience with QuickBooks Online. Then, when you are ready to convert your latest file to Your Books, you can -re-convert for up to 1060 days for companies without payroll (check with ProAdvisor support for details). It will replace whatever was in Your Books. The Customers in Your Books syncs with the Client list on your QuickBooks Online Accountant (QBOA) dashboard. When you add a new customer into Your Books, they will appear as a client on your QBOA dashboard (as shown in the image below). Thus, if you are playing around with your client’s data, then you’ll see their customers on your QBOA dashboard! This is probably NOT want you want to happen! Similarly, some people ask if they can use Your Books for a client. Again, the customers of your client would appear on your QBOA client dashboard so this is not recommended either. Remember you can use the sample company or test drive as much as you want and your clients can use it as well. It contains a sample company with data, downloaded transactions and more. It is a great way for you or your clients to play with QuickBooks Online and get more experience, test out how it works and more. Nothing is saved in it so every time you login, it is re-set. Your clients (or you) can login via this link: http://qbo.intuit.com/redir/testdrive or just Google QuickBooks test drive for the link. If you want access to the Accountants tools, then you should open the sample company via QBOA as shown in the image below. I hope this QuickBooks Tip has been helpful for you! Please share it with others!